Catch and pass with two hands and two eyes. Call the receiver's name. 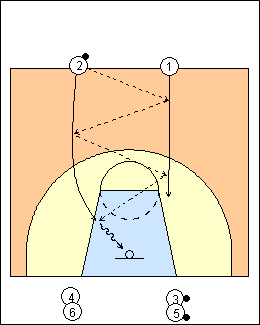 In pairs, chest pass back and forth to halfcourt on the run (not sliding) then go to the sidelines. Progression - both players bounce pass (pass in front of the receiver). 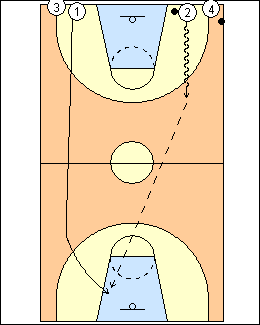 2 dribbles in at a 45-degree angle, jump stops, and bounce passes to 1 for a layup, both players go behind the baseline. See Layups - Kevin O'Neill. 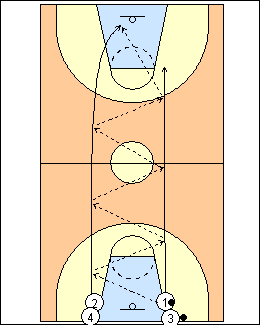 All players go to the same lines, but the balls change sides at halfcourt so that 1, 3 and 5 will dribble and pass. 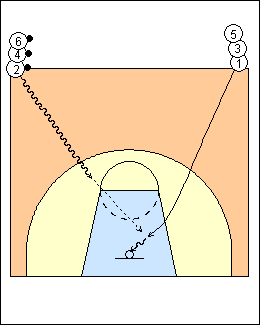 After chest passing back and forth to halfcourt, 1 and 2 bounce pass back for a layup (jump stop on the last pass). 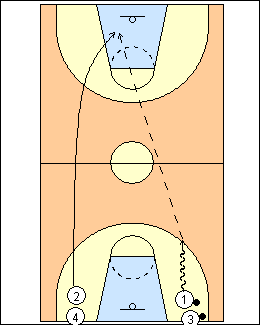 Fullcourt pairs passing with layup, use chest passes upcourt, the next group goes when 1 and 2 get to halfcourt, use bounce passes coming back, jump stop on the scoring pass. Progression - one player chest passes, the other bounce passes. See Passing - Tennessee two-man, DeMatha 2-lline. The two lines are wider. 1 takes two dribbles and passes to 2 for a layup, the next pair goes when they finish. Change sides and passers coming back.